Join us for a memorial tribute to our beloved friend, Roland Takaoka. Share your reflections. Your stories. We’d love to hear about him from you! Roland touched so many lives: Teaching, encouraging, inspiring. Living every moment fully. Serving as a beacon of hope, happiness and love. After surviving three strokes and being paralyzed on his right side, Roland focused on what he could do: Listening and giving to the needs of others. Spreading positivity. Uplifting people to their highest potential. 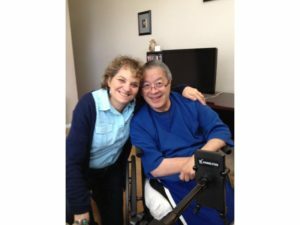 Roland was all about being “authentic,” and he chose to be happy, in spite of the challenges of working from his wheelchair. In this program, you”ll meet Roland’s loving and devoted wife, Barbara, who has never been on a live program before. She will share stories that have never been heard publicly… about their unusual courtship and romance. Barbara will also be happy to answer questions from the audience. Then — we’ll turn the program over to each of you — Roland’s wide circle of friends — who will share tributes and reflections. We know that Roland’s spirit will be listening in to this program… and we want him to know that his legacy lives on in each of us. Thank you so much for connecting with us online, and being part of the circle of Roland Takaoka’s spiritual family. As the Founder/President of MINMAX Media, Roland was a talented, popular internet expert, beloved by people worldwide. Host of The Monday Morning Marketing Smarties and Co-host of Stroke TV with Aaron Avila, Roland also served as a regular consultant on our show, The Difference Makers. His ingenuity in live-streaming production included training people on an innovative VCP Plug-In app, developed by his son, which allows audience members to access a comment stream for every live production. As Zig Ziglar once said, ‘”Many people have gone a lot farther than they thought they could because someone else thought they could.” Roland was that kind of leader. He believed in the highest potential of everyone he met. We are all better human beings for knowing him.